Probably the clearest indication of the seemingly inexhaustible fruitfulness of real-life Wing Chun martial arts pioneer Ip Man as a cinematic subject is the fact that “Ip Man 3” (葉問3) – director Wilson Yip and actor Donnie Yen’s latest collaboration – is the sixth film in eight years about the fighter to hit the big screen. The others include Yip and Yen’s first two of the trilogy, “Ip Man” (2008) and “Ip Man 2” (2010), as well as Herman Yau’s biographical bookends – “The Legend Is Born – Ip Man” (2010), “Ip Man: The Final Fight” (2013) – and the most artistic of all, Wong Kar-wai’s “The Grandmaster” (2013). Much like the battles between rival Wing Chun schools that figure in the plots of most of these films, these different productions represent opposing approaches to plotting, performance and visuals in telling the story of this influential martial artist. Yip and Yen’s trilogy morphed from the mostly straightforward biopic approach of the first film to turning Ip Man into more of a latter-day folk hero in the sequel, in a way less beholden to historical accuracy. 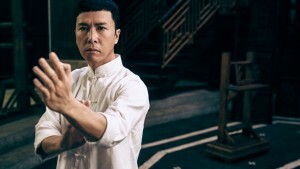 “Ip Man 3” opts for a bracingly old-school, back-to-basics approach closer to the first film. Even though there’s still talk of “foreign devils” and such, there’s much less of the strident nationalism of the first two films, as Ip Man battled Japanese and British foes. And while Ip Man’s wife Cheung Wing-sing (played by Lynn Xiong) was a mostly marginal presence in the first two films, often chiding her husband for his inattentiveness to their family, here she has a much more prominent role. A major plot strand in “Ip Man 3” concerns a serious health scare that prompts Ip Man to reconsider his priorities, and contributes greatly to the much warmer feel of this film, as opposed to its predecessors. The film picks up Ip Man’s story from 1959, as he is settled with his family in Hong Kong. Little time is wasted before the first fight sequence, with Ip Man facing off against a young Bruce Lee (Danny Chan). The original plan for this sequence was to have Ip Man fight a CGI version of the real Bruce Lee, which was scrapped when negotiations with Lee’s estate fell through. However, this scene retains the eye-popping use of special effects, with “Matrix”-like slow-mo shots of Bruce Lee kicking flicked cigarettes and streams of water. This fight, though slightly absurd, as well as historically inaccurate – Bruce Lee in real life had already left for the U.S. by then – is still quite dazzling, as well as a splashy start to the impressive contributions of “Ip Man 3”’s fight choreographer Yuen Woo-ping (taking over from Sammo Hung, who choreographed the first two films of Yip’s trilogy). Later scenes, however, mostly eschew obvious visual effects in favor of a more down-to-earth and scrappier approach to the fights. 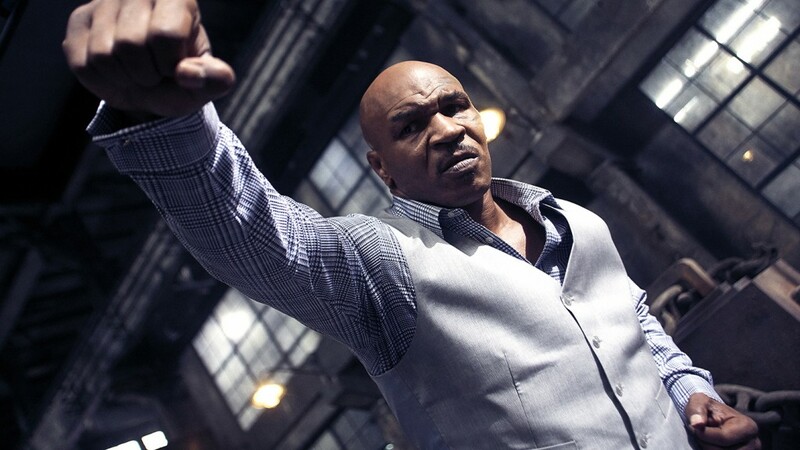 The first half of the film has Ip Man battling a gang of thugs, led by Ma-king Sang (Patrick Tam), who are intimidating building owners to sell their property to make way for projects being planned by their boss, an American land developer named Frank (Mike Tyson). One of these properties includes the grade school attended by Ip Man’s young son. Ip Man and his students stand guard against Sang and his men, who retaliate by barricading and later torching the school. These thugs decide to make it personal by abducting a group of the school’s students, which include both Ip Man’s son and the son of Cheung Tin-chi (Zhang Jin), a fellow Wing Chun practitioner whom Ip Man has gotten to know. This occasions one of the film’s most impressive fight sequences, as Ip Man and Tin-chi battle dozens of opponents in an effort to save the children. Ip Man’s conflict with the land development thugs also gives rise to more showy fight spectacles, such as Ip Man fighting a Muay Thai warrior in the confined quarters of an elevator car. The centerpiece of this section of the film involves – in a bit of stunt casting recalling Kareem Abdul-Jabbar vs. Bruce Lee in “Game of Death” – Ip Man fighting Mike Tyson himself. As ballyhooed as Tyson’s appearance has been, he actually figures very little in the narrative, and his role is not much more than a glorified cameo. He only appears in a handful of scenes before his non-climactic fight with Yen, mostly barking orders to his underlings in English and Cantonese. He sometimes appears with a Chinese woman and a little girl whom I guess we’re to assume is his wife and (adopted?) daughter, but his character’s backstory is left so blank, it’s impossible to be sure. Tyson’s character seems to have simply appeared out of nowhere as just the latest foreigner for Ip Man to battle. As far as the fight between Ip Man and Frank goes, it’s rather brief but thrilling to watch and very dynamically staged. The sheer driving force of Tyson’s punches and the balletic dexterity of Yen’s Wing Chun maneuvers form a visual dynamic that is quite fascinating to behold. However, their encounter more or less ends in a draw, and Frank isn’t seen or heard from again for the remainder of the film, confirming the extraneity of Tyson’s character to the narrative. It turns out that Ip Man’s most significant antagonist is Tin-chi, who in the second half of the film challenges Ip Man’s legitimacy as a Wing Chun master, and demands a fight between them to settle the matter. One major weakness in the writing is the fuzziness of Tin-Chi’s loyalties, where he seems to be playing dual sides. On the one hand, Tin-chi is willing to hire himself out to Frank’s goons, but a few scenes later, he’s fighting alongside Ip Man against them. Now this may be because Ma-king Sang, Frank’s main henchman, has included Tin-chi’s son among the kids he’s held hostage, but this doesn’t really make sense, since Ma-king and Tin-chi are supposed to be on the same side. Similarly, Tin-chi initially makes money fighting in underground “Fight Club”-style matches, but later presents himself as a paragon of pure martial arts practice. Again, his earlier actions can be explained away as simply out of a need for money to care for his son, whom he seems to be raising alone. However, these sudden shifts of character motivation never really ring true, and simply leave one baffled. Despite these unfortunate lapses of story and character, “Ip Man 3” still manages to ultimately succeed as satisfying entertainment for a number of reasons. The staging of the fight scenes by Yuen – who also choreographed the fighting in “The Grandmaster,” an extremely different take on Ip Man’s story – are often gritty and realistic, with flashes of transcendent beauty embedded within them. The main performances also impress greatly. Yen, just as in the previous two installments, brings an understated grace to this role, providing wonderful shadings to a character whom on paper would seem to be unrealistically virtuous. Yen is given excellent support and counterbalance by an equally accomplished performance by Xiong as Wing-sing; together they are beautifully convincing as a loving couple whose bond proves to be far stronger than any foe Ip Man must face. Ip Man and Wing-sing figure in a lovely montage late in the film that connects martial arts to dance, as well as another, more melancholy montage near the conclusion that may bring a tear to one’s eye. In scenes such as these, “Ip Man 3” transcends being merely an action film, and transforms into one with a deeply heartfelt sense of humanity. “Ip Man 3” is now playing in U.S. theaters. For locations and showtimes, visit the distributor Well Go USA’s website.